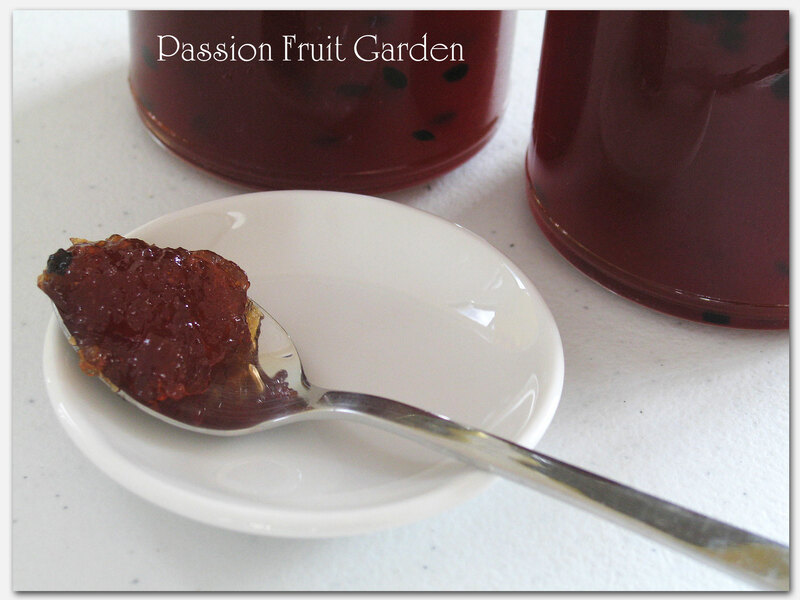 If you have found this post looking for a passionfruit jam recipe, you may be interested in knowing that I made it again adding the pulp after the setting point was reached. I prefer the resultant jam. Here is a link to that post. Hello, everyone. We are back after our little break. A good time was had by all. Thank goodness, the passionfruit and tomato situation seems under control for the time being. The passionfruit have all but finished, the San Marzano tomatoes are ripening at a moderate rate and the self-sown cherry tomatoes are yet to peak. During the passionfruit flush, I searched the web for ‘passionfruit jam’. I was amazed to find that there, actually, was such a thing. Passionfruit pulp is very low in pectin but, it appears, the soft white inner part of the shell is very high. Recipes for passionfruit jam use this part of the fruit to provide the required pectin. If you try to make jam just using the pulp, you end up with passionfruit syrup. Lovely, but not what we are looking for here. As you can tell from the photo, my jam is very firm and, for once, I didn’t overcook it. I boiled it until it just reached 105°C (the temperature at which jam ‘sets’) then whipped it off the heat. It just goes to show there is a lot of pectin in those shells. Subsequent to making this jam, I searched the web, again, but this time for ‘passionfruit skin jam’ (which is, essentially, what this recipe is). I found an Australian Women’s Weekly recipe which adds the pulp after setting point is reached. That would make a softer jam. I would try it, if not for the fact that I don’t think I will be getting many more passionfruit this season. Maybe next year. When making the jam, I put the pulp through my electric mouli to remove all the seeds and then put two teaspoons of seeds back. The recipe did not call for this but I didn’t like the idea of seeds galore in my jam. It is a preference thing: to strain or not to strain. If you want to strain the seeds and don’t have an electric mouli, put the pulp in a food processor and pulse it a few times to release the pulp from the seeds, then put the pulp through a stainer. Push down hard to get as much pulp as possible. If you strain the pulp, I wouldn’t bother putting any seeds back (like I did). They don’t add much to the appearance of the jam. Interestingly, the jam takes on the colour of the skins. If you have purple passionfruit, you will end up with purple jam and if you have yellow passionfruit, you will have yellow jam. My passionfruit are Red Panama and my jam is a very similar colour to quince jam. I found this recipe on the Australian Reader’s Digest site. Here is the link to the original. These quantities make about 1 litre. Wash the passionfruit then cut them in half and scoop out the pulp. Put the pulp in a bowl, cover and refrigerate until required. Put half of the passionfruit shells in another bowl (discard the other half). Cover with the water and leave overnight. Transfer the shells and the water to a pot and boil for about 30 minutes, or until the insides of the shells are translucent and tender. Drain the shells, retaining the cooking water. Scoop out the soft inside part of the shells and discard the papery outside. Either chop (if you like your jam chunky) or process/blend (if you like it smooth) the retained soft inside part of the shells. I blended mine with a stick blender. Put the blended shells, reserved passionfruit pulp and one cup of the reserved water into a large pot and bring to the boil. Add the lemon juice and the sugar, stir until the sugar dissolves and then boil rapidly until setting point is reached. Either check the temperature – 105°C – or test a small amount on a cold saucer. This entry was posted in Homemade Produce, Jams and Jellies, Passionfruit, Preserving the bounty and tagged How to preserve passionfruit pulp, Passionfruit skin jam, What to do with excess passionfruit? by Glenda. Bookmark the permalink. I did make a batch (using very few of the skins) and it was wonderful. When I tasted the skins, after boiling them, they taste bitter. Is that normal? Hello! I made this jam last week it’s absolutely delicious. I have a question , how long does this last? Does it last as long as strawberry jam? Hi Mai, Yes, it keeps well as long as you use sterilised jars and have sealed it properly. It’s keeping qualities are no different to any other jam. Thanks so much! I have a banana passionfruit vine that is producing a ton of fruit this year. My family will be getting passionfruit Jam for christmas this year! Love it! Hi Helen. The second time I made passionfruit jam I left the seeds in and it was fine so I would leave it as it is. If you really don’t like the seeds, I would put the jam back into a pot, add some water about 1/2 a cup, heat it up then strain the jam through a course sieve or better still a mouli. I would then re boil it until it is the consistency you like and then put it into sterilised jars. I would love to hear how you go. Hi Leah, you definitely need to use the shells as the flesh has virtually no pectin in it. Welcome back Glenda. We don’t see passionfruit over here that often but for Easter my daughter bought a variety of pastries & in the batch were some passionfruit macaroons. OH WERE THEY GOOD!!! It’s too bad no one else could verify that since I may have grabbed all of them. I think I’m going to go on a passionfruit quest now. Hi Diane. Good to hear from you. Has the snow melted? Your place would be too cold to grow passionfruit. You will have to buy a couple. They are great on pavlovas or with meringues. We FINALLY got rid of the last snow pile. Had some warm weather but then we dipped back down just above freezing. Hey, this is New England so we’re kind of used to it but I could use some warm breezes here. I figured we’d never be able to grow passion fruit here. Very jealous because from the little taste I got they were awesome. Diane, passionfruit are very popular in Australia. We particularly like them on pavlovas. Hi Natasha. Passionfruit should do well in California. I bet you will be overwhelmed with them soon. To use both fruits, try Tomato and passion fruit jam. We made it about 35 years ago and its superb. Pity my ex took the cookbooks when she left. I think it was from the Womens weekly or the Country womens association cookbook. Worth hunting it down. Thanks so much. I have heard of tomato and passionfruit jam but never seen a recipe. I will try to hunt one down. Hi Moya, this is my first time. I was keen to try the recipe once I found it. You answered a question I’d been wondering about. While we were away the G.O. bought Passionfruit Butter but there was also Passionfruit Jam in a range of hues… now I know. Hi Ella. My brain tells me passionfruit jam should be yellow like the pulp but it doesn’t work like that. Love, love, love this! Welcome back, Glenda.